Summary of today’s show: Cardinal Seán and the priests of the Archdiocese of Boston gathered on Thursday for their annual convocation at which they considered the latest news and feedback on the ongoing process of pastoral planning for the future of the Church in eastern Massachusetts. Scot Landry. Fr. Mark O’Connell, and Fr. Chip Hines listen to the compiled feedback from throughout the Archdiocese as presented to the convocation by Msgr. William Fay, chairman of the Pastoral Planning Commission, and consider what lessons have been learned, what proposals have been given support, and what might have changed. Today’s show: Scot said earlier today he was able to go to Boston Common for the Stand Up For Religious Freedom rally, at which Janet Benestad who is the secretary for faith formation and evangelization spoke. He said people came up to him and told him how they listen to the radio show every day. One of them was Scot’s former high school teacher. The rallies occurred in 160 cities around the country on today which is the anniversary of the signing of the Bill of Rights. 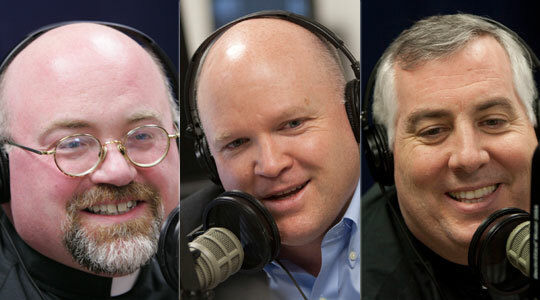 On today’s show, they will discuss the priestly convocation that occurred yesterday that covered evangelization and an update on the process of pastoral planning. We will share clips from Msgr. Fay’s address, but first getting Fr. Chip’s and Fr. Mark’s takes on the convocation. Fr. Chip said something we learned from 2004 was the ned to listen and this process is much better at that. Fr. Mark said he looked around the room and saw a lot of priests, but then recalled how even more priests there were when he was ordained 20 years ago. This pastoral planning recognizes that if we don’t plan all the things we fear are going to happen anyway, but in a haphazard way. Scot said the first Reconfiguration was done in crisis mode. This pastoral planning is being done when we’re not in a crisis and to create the opportunity and resources for evangelization. Fr. Chip is living this out with this two parishes, hacking a parochial vicar to help instead of having the two of them each running one parish. Scot said Msgr. Fay said the commission received 8,000 pages of feedback on the proposal. 2,500 group responses were responded. These were groups of pastoral councils and the like. The general response was that they were moving in the right direction. Some responses reinforced what the commission was proposing and others changed their directions. A clip of the first takeaway from the surveys: 66% thought the pastoral plan is in general the right direction. 15% thought it was wrong direction and proposed closing parishes or seeking priests from other countries. 84% of people were clearly opposed to closing parishes. Only 7% were in favor of closing parishes. Scot said most people consulted though the plan heads in the right direction, even if they don’t agree with every single thing. Having attended some of these consultation, Scot has seen similar responses. Fr. Mark said the priests who attend the convocations are those who are generally supportive, while those who don’t go are generally not supportive of what’s going on in the archdiocese. He said it’s clear that everyone agrees that doing what we’re doing now isn’t the answer. He said getting a bunch of foreign priests wouldn’t solve the problem. Scot said the problem in many parishes is that we don’t have the resources to go out to bring back those who aren’t coming to Masses. Fr. Chip said in his experience is that some people complain about priests with accents. Regarding the status quo, Fr. Chip said that when there is an open pastorate, they have to pull a priest from another parish and then have a domino effect in filling holes. A clip from the third takeaway from the surveys: Finding the right pastor is key. When they first suggested that current pastors from a group of clustered parishes would not become pastor of the whole group. 70% of people wanted to keep their own pastor. What they did learn was that the principle they introduced— to keep parishes in the cluster from feeling slighted—was that the right man needs to be found as pastor. Scot said he’s happy with this change in attitude. He said a parish from a grouping would already be known by the parishes in that grouping. Fr. Chip said he has to be case by case as opposed to a blanket policy. In some case bringing a priest in from outside might be best. Fr. Mark said we learned the lesson in Reconfiguration in which sometimes it was best to keep a guy in place and sometimes it was best to replace him. Fr. Mark said a lot of the people in the parish are too focused on the pastors. He said that’s shortsighted because priests get reassigned all the time. They should look at macro issues of the culture and neighborhood and the like. Another clip from Msgr. Fay: The implementation has to be phased in. 68% of people wanted it to be gradual, deliberate, and organic. Start small and build, learning from best practices as they move forward. They may start with two or three clusters in a region, then step back for two or three years to learn best practices. But the hope would be after five years they’d be moving the diocese pretty well forward on this. Scot’s sense was that there was a lot of agreement among the priests for this. Fr. Chop said it makes sense to do it this way. We’re already phasing it in with 20% of parishes sharing a pastor with other parishes. Fr. Chip said he’s always known the Church has moved slowly and now we’d been moving quickly. Scot said that was the experience of Reconfiguration, a suddenness. Fr. Mark remembers the presbyteral council being asked whether to phase it in and a priest spoke up and said the bandage should be ripped off quick. That was the advice given to Cardinal Seán and now all the priests who were in the room have learned the lesson. Fr. Mark said 99% of the priests in the room were comfortable with Msgr. Fay’s style of leadership. He and Deacon Chuck Clough have led the process to take its time. The next takeaway from Msgr. Fay: Parishes have very different cultures, and not just ethnic cultures. Parishes do things differently. they learned that two parishes right next each other do things in very different ways and have done them that way for many years. Legitimate differences are to be respected and the pastor of those parishes has to be able to recognize that. While the pastor guides a group of people who have been that parish for a very long time. We need to help folks in parishes to work together to bring the best out of one another and not try to collapse differences into a flat homogeneity. Scot said each parish grouping should be treated individually. It’s good to note that parishioners that might look the same on a statistical sheet, the history and culture of those parishes can be so different they might not be a good fit when grouped together and maybe they shouldn’t be grouped differently. Scot said it’s a recognition that some of the proposed groupings need to change. But Fr. Ship said some of those groupings will need to stay and those parishes will need to find a way to work together. Parishes need to recognize they’re part of something bigger and they will need to change a bit to work together. The next takeaway: TRaining is critical. 82% said training should be integral and 72% would be willing to do the training. Scot said people are hungry for training to make sure we can accommodate cultures and understand the vision of Cardinal Sean and learn to evangelize and invite people to join us once again. Fr. Mark said this is a critical stage in the history of the Archdiocese We’re doing something different and changing our pattern. We have to make sure we’re going to do this right so we’re all formed for this new reality. Fr. Chip said Msgr. Fay also said we need to be flexible with the training, like online or other kids of options. Part of it is true leadership training. He said it’s important that it’s mandatory. Scot said a key here is leadership of change, helping people through the process of change. Everyone needs at least a refresher on that and everybody in leadership positions need to sharpen their skills in this area. Fr. Mark noted that some parishes will still standalone and even those parishes will need that training. Scot said they’re still working out what that will look like. Msgr. Fay’s eighth takeaway: there is exploratory thinking about how to bring parish and finance councils for parishes are brought together without violating canon law that each parish have its own. Scot said they need more information on the idea of a pastoral and a financial council that represents the grouping of parishes. A key is how to keep assets separate, and Scot said you have written rules on how to do this and give processes and norms. Fr. Chip said he likes to keep some things separate in his two parishes. For instance, he keeps the bills and records for two parishes in two separate places. How we do that is a good question and he hopes the training will help with that. Fr. Mark said as a canon lawyer, that the law doesn’t seem flexible and the Vatican is on our side and is working with the archdiocese to find an acceptable position. This is innovative and will help the entire country. Second, during the table discussion at the convocation, one of the pastors was concerned about having two parishes in a cluster in which one is very poor and the other is very rich where you can’t combine assets. Fr. Mark said one good thing is that people who help the better off parish will be able to help the poorer parish with how to get better. Scot speculated on a norm that would say that the parishes would pay the combined salaries of the pastoral service team based on their relative ability to pay. Fr. Mark said he can imagine a much bigger parish paying more than the other parish in the grouping. Msgr. Fay’s last takeaway: Will the new collaborative structure really strengthen parishes financially? He said those who have worked deeply in this area believe that this is true. Scot said there is concern over the notion that parishes that are struggling financially today will be better off in these groupings. Fr. Chip said the key is to have the pastors involved at the local level. Fr. Mark said the Cardinal is asking us to look at this optimistically and he’s asking us to strengthen parishes and train for evangelization to attract Catholics home and bring new Catholics. Scot aid all the problems of the Church find their root in the Mass attendance problem. If we’re able to follow Jesus’ Great Commission— Go and make disciples of all nations—live and share the faith with others, we will be much better off. Scot said the addresses by Msgr. Fay, Bishop Malone and Cardinal Seán will be posted on the Planning2012.com within the next week. Now as we do every week at this time, we will consider the Mass readings for this Sunday, specifically the Gospel reading. and twelve pillars for the twelve tribes of Israel. the other half he splashed on the altar. carrying a jar of water. Then he will show you a large upper room furnished and ready. and they prepared the Passover. and they all drank from it. which will be shed for many. they went out to the Mount of Olives. Scot said the feast of Corpus Christi was instituted in the 12th century. We used to celebrate the Body and Blood of Jesus on Holy Thursday but because of the focus on Good Friday and Easter, the Church wanted to have a Sunday when we focus just on the Blessed Sacrament. Fr. Chip loves the connection between Moses sprinkling the blood and Jesus giving us his blood as true drink. The Eucharist is the source and summit of everything we are as a Church. Fr. Mark said he was also struck by the juxtaposition of these two readings. When Moses does the sprinkling and the people accept to follow the covenant, then if they break the covenant they are cursed which happened. Jesus’ blood restores that covenant. Fr. Mark said his first Mass was on the Feast of Corpus Christi. He said it’s such a privilege and honor for priests to hold the Eucharist in their hands as they say “This is my Body” and “This is my Blood.” Scot says he tries to receive the Eucharist as such a way that he gives witness to those who are watching of what he believes. He asked all listeners never to take the Eucharist for granted. Receive in such a way that little kids will see that you believe. Fr. Chip said the children preparing for First Communion show such anticipation and everything about them is crying out for it, even as others come forward with their minds elsewhere.